OSLO --- On Friday 29 March, KNM Maud, the Norwegian Armed Forces' new logistics vessel, arrived at the Haakonsvern naval base in Bergen. Maud is a new and important logistics and support resource in the Navy. With her large cargo capacity, the ship can resupply her own and allied forces, allowing operational units to operate further out in the theater of operations. “In addition to being important for strengthening the operability and endurance of the Navy's other vessels, KNM Maud is a sought-after resource in NATO. We have planned that KNM Maud will participate in, and supportn NATO's standing maritime forces, says Prime Minister Erna Solberg. The logistics vessel is the largest ship in the Navy, with a tonnage that is over five times larger than a frigate. The vessel can support all Navy vessels and can operate in most waters worldwide. KNM Maud can also act as a command vessel to conduct military operations from the sea. 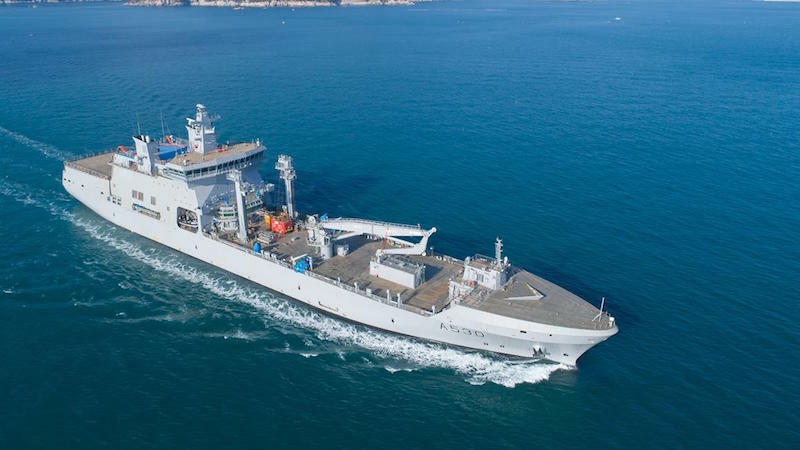 “KNM Maud will give Navy vessels significantly increased operational availability and the ability to be present in the operating area over time. The navy must be able to operate in the north for long periods of time, both offshore and in coastal waters. With improved logistics, our ability to monitor the nation's most important areas will be significantly reinforced,” says Defense Minister Frank Bakke-Jensen. The Navy's primary function is to safeguard, at all times, the military defense of Norwegian territorial waters. This responsibility also entails preserving Norway’s freedom of action against military and other pressures, and ensuring free access to Norway's waters and ports. The vessel will also be able to support the other military services, and also the civil population in case of disasters and emergencies. Maud is capable of supporting civil society during a crisis or disaster, humanitarian operations or search and rescue operations (SAR). She is equipped to receive and treat up to 48 patients, and has her own operating room, trauma room, monitoring, CT scanner, pressure chamber and other medical facilities available in hospitals. The Defense Matériel Organisation and the Armed Forces took delivery of KNM Maud from South Korea’s Daewoo Shipbuilding and Marine Engineering in the autumn of 2018, and her christening is planned for May. The vessel will now be equipped with defense-specific installations. KNM Maud is expected to be fully operational by 2020. (EDITOR’S NOTE: KNM (His Norwegian Majesty’s Ship) Maud is named after the first queen of independent Norway. She can carry up to 200 tonnes of ammunition, 30 tonnes of foodstuffs, as well as boats, vehicles and 7,000 tonnes of diesel fuel, with a maximum displacement of 27,500 tonnes and a top speed of 18 knots. She is the biggest vessel ever operated by the Norwegian Navy.